Being a dentist by profession it is generally a habit to be on the look out for dental issues being blogged around the world. 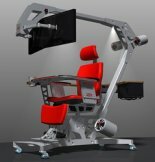 This recent image of the Ultimate Computer Station caught my eye while browsing through Gizmodo which most definitely remains the center of all upcoming geek toys. PCE the creators of this computer station seem to have incorporated a dental chair look-alike functionality of a dental chair for the workstation. Customization seems to be off-the-charts to an extent it even has wheels to even spare you the heartache of going to the refrigerator for food on foot leaving your keyboard. The better deign a chair that will pull the weight as the computer couch potato is going to get bloated real quickly sitting and eating on this chair all day, to an extent one might even be able to take a nap on the job.